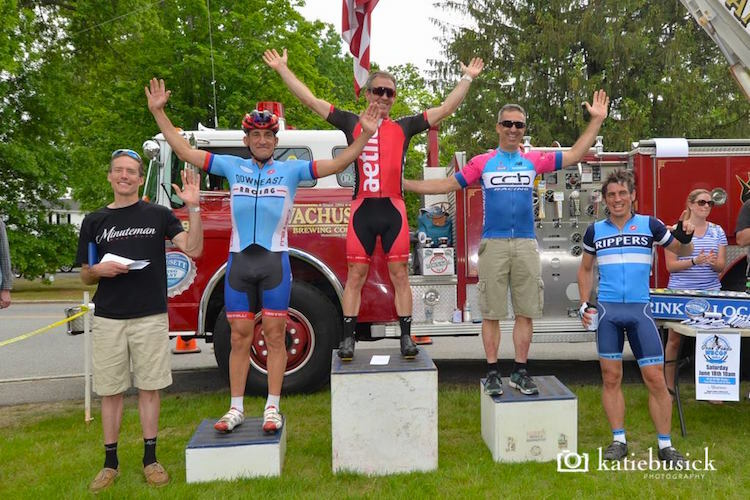 Minuteman Road Club » Blog Archive » RACE REPORT: ANOTHER GREAT YEAR FOR THE KEN HARROD MEMORIAL ROAD RACE! 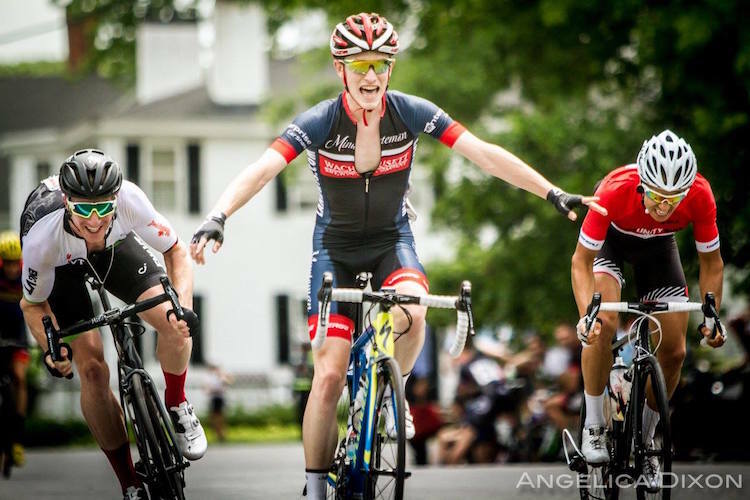 The men’s Category 5 race, made up of riders just starting their racing careers, was essentially a war of attrition, with the initial pack of 75 riders whittling itself down each time up Oak Hill. 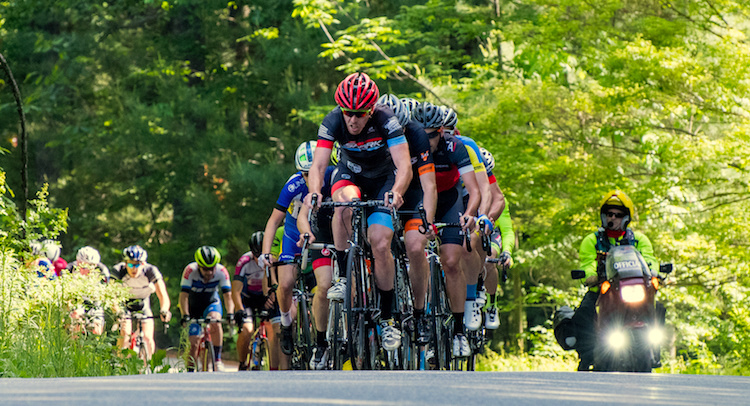 Eventually, with a group of just under 20 riders remaining together as the field rolled towards Harvard Center for the final time, Jon Jantz of 545 Velo attacked the field in the final stretch to take the win with a 6 second margin. In the Category 4 race, Zach Robbiano rolled off the front of the race at the top of the second time up Oak Hill, building an almost two minute gap on the main field. The main pack eventually collaborated to reduce this deficit, but Robbiano still held on to finish 12 seconds ahead of anyone else, giving the 545 Velo team its second win of the day. 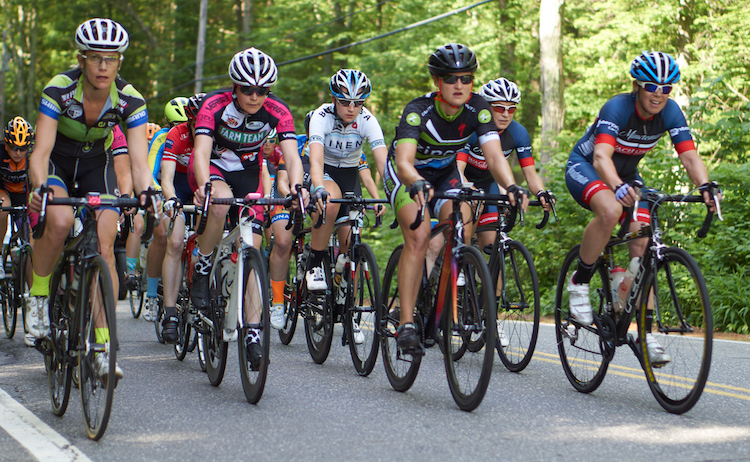 The women’s field, containing two races, with the Pro, Cat1, & Cat2 riders and Category 3 and 4 amateur racers each scored separately. The two races stayed together for most of their distance, though the Oak Hill climb and a major crash winnowed the pack to 8 pro and 13 amateur women. Both races ended in sprint finishes, with Leslie Timm of Sunnapee/Continental Paving/Buchikas taking the Pro sprint and Cody Harris of Portland Velo Club taking the amateur race. Later in the day, more than 50 Category 3 men raced 50 miles over the course. The field remained mostly intact for the first 2.5 laps, with a few riders trying their luck off the front of the race, but none of these attacks gained more than a few seconds. The pace picked up, however, on the third time up the Oak Hill climb, and once the dust settled, only 35 riders remained. That group shed another 10 riders on its final time up the climb, with Josh Saxe eventually winning the 25-man sprint. The largest race of the day was the Masters men, where more than 80 riders took the start. The race was actually two races in one, with 45+ and 55+ racers competing together, but scored separately. The race started aggressively, with lots of attacking and counterattacking as small groups of riders tried to gain an advantage on the field. These constant changes of pace and two major crashes eventually whittled the field down to just under 20 riders, with Aetna/Expo Wheelmen’s Todd Bowden taking the sprint for the 45+ race and Arc-En-Ciel’s Randy Rusk taking the 55+ honors. The final race of the day saw 45 Pro, Cat1, and Cat2 men competing over 6 laps (60 miles) around the course. Early on, a group of 6 pulled clear of the field, and after two laps they’d established a 90 second lead over the main pack. The presence in this group of local pro and fan favorite Anthony Clark (Squid Bikes) had many speculating that this was the winning move. The field had other ideas, however, and once the main group began to collaborate in earnest, the gap quickly fell until the 6 were absorbed by the group as the race crested Oak Hill for the third time. Things stayed together over the next lap until Tim Ahern (Team ERRace), Alex Carmona (Community Bike), Patrick Collins (MRC), Connor Jennings (ENGVTUnTapped), and Sam Rosenholtz (Green Line Velo) pulled clear in the final mile of the lap. This group collaborated well, and their lead grew to over two minutes within the next lap. Not wanting to be caught by the charging pack behind, the five riders pushed as hard as they could on their last time up Oak Hill, dropping the best sprinter in the group, Rosenholtz, up the climb. At speeds in excess of 45 miles per hour, the group of 4 sped into Harvard Center, where the host club’s Patrick Collins took the win. Minuteman Road Club looks forward to hosting the 2017 edition of the Ken Harrod Memorial Road Race, which will be on the same weekend (the Saturday after Memorial Day) which is Saturday June 3rd 2017. For complete race results, visit the 2016 Ken Harrod Memorial Road Race page on Road-Results. See more of Katie Busick’s photos here. This entry was posted on Monday, June 27th, 2016 at 8:46 am	and is filed under Race Reports, Road Racing. You can follow any responses to this entry through the RSS 2.0 feed. Both comments and pings are currently closed.